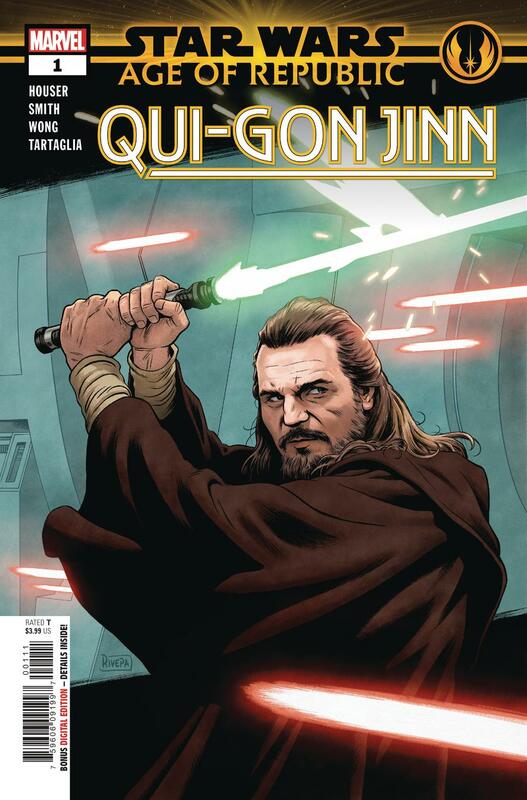 Star Wars: Age of Republic - Qui-Gon Jinn #1 is a beautiful, introspective meditation on the state of the Jedi Order prior to the Clone Wars and fall of the Republic. It’s told through the eyes of the Jedi Master as he questions the place of his order and himself. Unfortunately, the out-of-place mission that frames Qui-Gon’s journey is bizarre and convoluted enough to cast a shadow over the entire issue. The story begins with Qui-Gon on the planet Bri’n. He is tasked with protecting the Priestess of Wood from the Metal Clan — both of whom sound like they were devised by a four-year-old attempting to create an allegory for industrialization, but didn’t know what any of that meant. There’s a high fantasy vibe to this section and none of it looks or feels like Star Wars. The Metal Clan wear scaled golden armor and hold futuristic assault rifles with banana clips protruding from them. The Priestess of Wood must protect her trees from the clan and they can’t so much as touch a leaf without her permission… unless they kill her first. After escaping with the priestess, Qui-Gon’s mission is apparently to persuade her to recruit off-world allies for the cause. Supposedly, she is staunchly against this… except that the Jedi are off-world allies who she was already open to hiring. The subtitle of this comic is “Balance” and when Qui-Gon experiences a Dark Side vision (not unlike Luke’s in The Empire Strikes Back), he comes away with a goal of non-violence… then he returns to the Priestess and tells her to hire thugs to fight for her. I don’t know how any of this is supposed to make sense and none of it has much to do with that titular balance (although the word is repeated a few times throughout the conclusion). It almost feels as though another theme was scratched out and hastily replaced. If you skip the first four and last two pages (the parts of the story featuring the high fantasy characters and their inane plot), this issue becomes twice as strong. The central story is an introspective and solitary journey that required no frills. Qui-Gon’s characterization is serviceable enough in that he’s monkish but open-minded, and he even gets to throw in a few aphorisms; he’s back in a broad-strokes kind of way. But for the first revisit in a very long time, I had hoped they might use Age of Republic to expand our heroes or hit stronger, more important notes in their development. This is a comic that would be infinitely better if it contained no word balloons and relied on the strength of the art alone. Because the art is incredible. The centerpiece of this issue is a vision that takes place over four pages, not a word to be found on any of them — not a gutter in sight. It’s absolutely phenomenal sequential art and the way Qui-Gon’s whirring lightsaber divides a splash and leads your eye through a battle creates one of the best single pages I’ve seen in a Star Wars comic. The flaw, of course, is the simple theme (balance) forced upon a complex sequence that could be left to the viewer to interpret — and, again, doesn’t quite seem to fit. Had this been a standalone issue, not under the Age of Republic marquee, it would be almost impossible to explain how this idea was published. It’s a strange “elfin tree priestess versus the purple goblins” story wrapped around a gorgeous and mysterious vision sequence. Then its all oversimplified by writing that announces straightforward themes left ambiguous by the art. Still, it’s some beautiful new work in an era Marvel has barely touched and the visual story is not only worth the price of admission, but it might also be enough to balance out the deficiency of the written story.